appreciate to show a representation on this page. We have just started in January, to look in to collecting your microscopy photographs, on to our new site. We very much appreciate receiving the first photographs and approval, to place them on our 'Microscopy Photographs' page, soon. Construction of a proper imaging data-base and page, is in progress. We thank you for your co-operation and support! 02-Actin + Keratin (Placed: March 17, 2015). aimed at the super-resolution community. typical drift of < 30 nm in X and Y, and <60 nm in Z for a full hour, after allowing to settle for 20 minutes on the microscope. 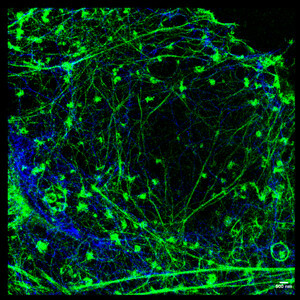 Images, by Leila NahidiAzar M.Sc., who is in the Jalink Lab, The Netherlands Cancer Institute, Amsterdam, The Netherlands. Kees Jalink & Laila NahidiAzar. PI, cellbiophysics & advanced light microscopy group. Plesmanlaan 121, 1066CX Amsterdam - NL.